Learn how to make easy breakfast croissant boats and customize them for your taste! 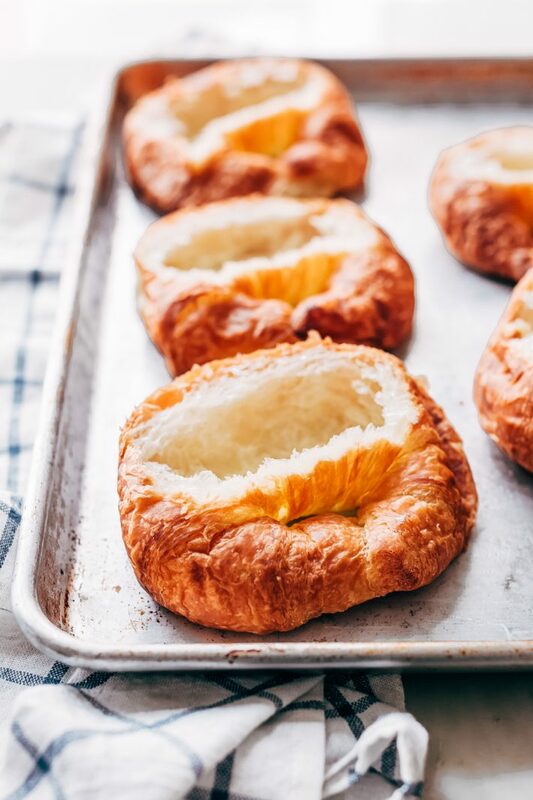 These croissant boats are the perfect grab and go option for busy mornings! You can make and freeze them, then just reheat in a toaster oven! We’ve all had them. Mine always happen when we both hit snooze on the alarm clocks about eight times before realizing we’re going to be super late. Hubby needs to be at work by 8 am and has an hour-long commute while I’m trying to rush out the door to get in my Orange Theory class before I’m awake enough time to talk myself out of it. 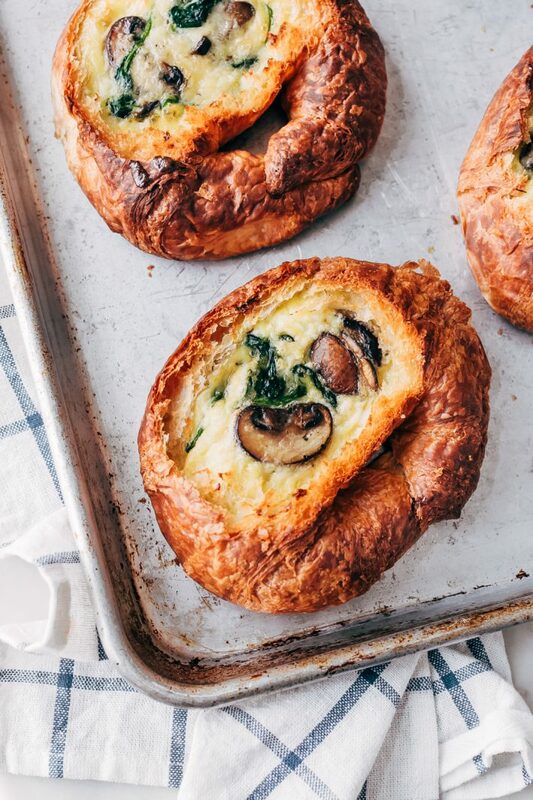 For mornings like these, I love having these simple breakfast croissant boats in the fridge or freezer because all I have to do is pop one into the toaster oven and make coffee. 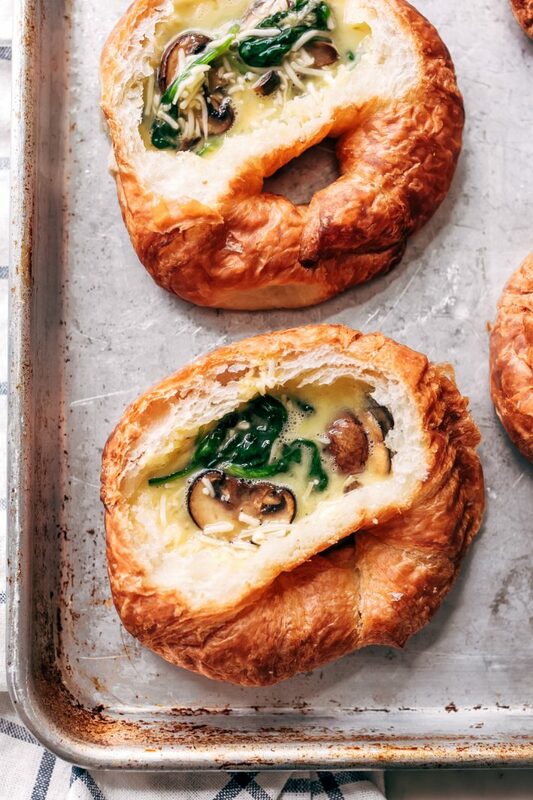 We’re both big on having eggs for breakfast, so these croissant boats fulfill all the requirements while providing a little more nutrition with all the healthy veggies we’re going to be squeezing in. A balanced breakfast that’s all ready to go without even having to turn on the stove. In the past, I’ve shared my breakfast casserole  with you guys, and so many of you have made it and loved it! 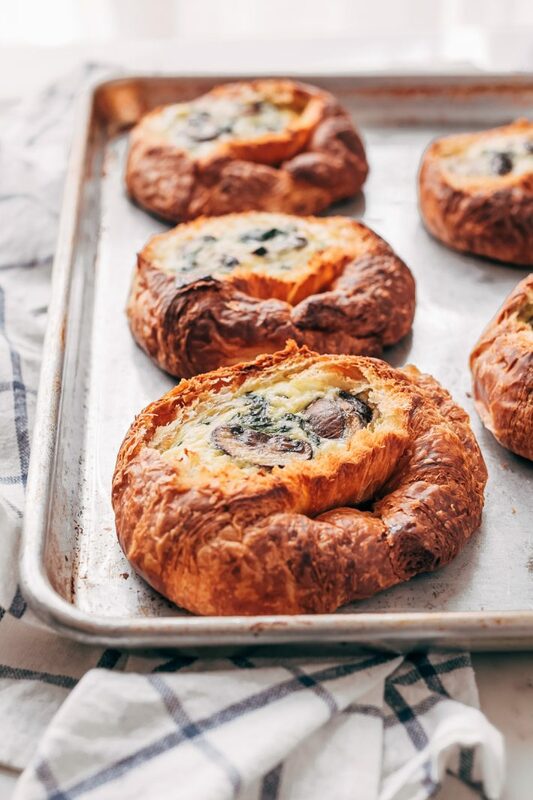 Today’s recipe is just a version of that casserole shoved inside of a croissant boat and made easy enough to munch on with one hand while you’re on your way to dropping the kiddos to school. Speaking of… did I really just say the ’s’ word? For all you moms and dads that are not looking forward to the breakfast battles that will start come the first day of school, this little number goes out to you! 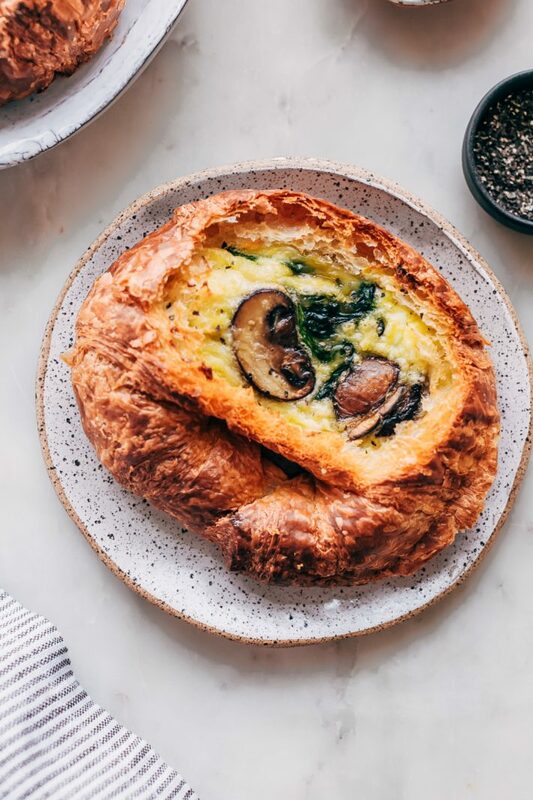 I see you and your hair-pulling struggles and urge you to grab croissants, stuff them with whatever the heck plus eggs your kids will eat and load these boats up with cheese. The best part is you can customize croissant boats however you like, so make a kids version and an adult version with everything they won’t eat. First off, croissants. You can get any kind you like: multi-grain, the mini variety, the big ones from Costco that will satisfy even the biggest breakfast appetite. I usually use the larger croissants from Costco as they hold a little more of the egg mixture than the smaller stuff. But the little ones would be perfect to convince the tiny picky eater in your life that these are worth a try. Next, eggs. You’ll need anywhere from 6-8 eggs. I really like to load up the croissant boats, so I go the eight egg route and fill it up nice and full. Trust me; whether you’re having these for breakfast or lunch, you certainly won’t be hungry after this! Finally, we get cheesy. 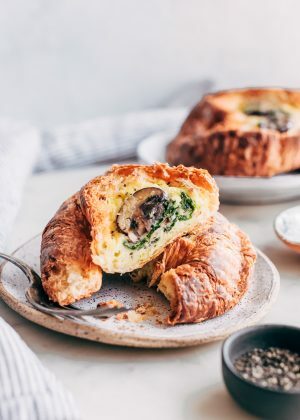 I love adding cheese to my breakfast croissant boats or my breakfast casseroles. It’s the stuff that brings the whole show together. Feel free to use any kind of cheese you like here! Shredded swiss, mozzarella, white cheddar, sharp cheddar, gruyere, feta, goat cheese and pretty much anything else that pairs well with eggs! See what I mean? The possibilities are endless. Can you make and store these croissant boats for later? Oh yeah, you can! You can make these boats, bake them off, let them cool, and then individually wrap each in freezer paper, pack them into a zip top bag and have them all set to go. I do suggest allowing the boat to defrost in the refrigerator overnight so that it doesn’t take as long to heat up in the toaster oven the next day. To reheat once it’s defrosted, you just pop it into a 250-300ºF toaster oven for 8-10 minutes. So while that’s heating up, you can get dressed, put lunch together, and put a pot of coffee on. Or you know, the 10-minute makeup routine ain’t a bad idea either. You can also make these on Sundays as part of your meal prep for the week. The boats will easily last in the refrigerator for five days, so a whole weeks worth of breakfast in the fridge at one time is a very real possibility. With so many flavor combinations it’s pretty hard to get bored of these homemade croissant boats! Just switch up the flavors and see which one you like best! Learn how to make easy breakfast croissant boats and customize them for your own taste! 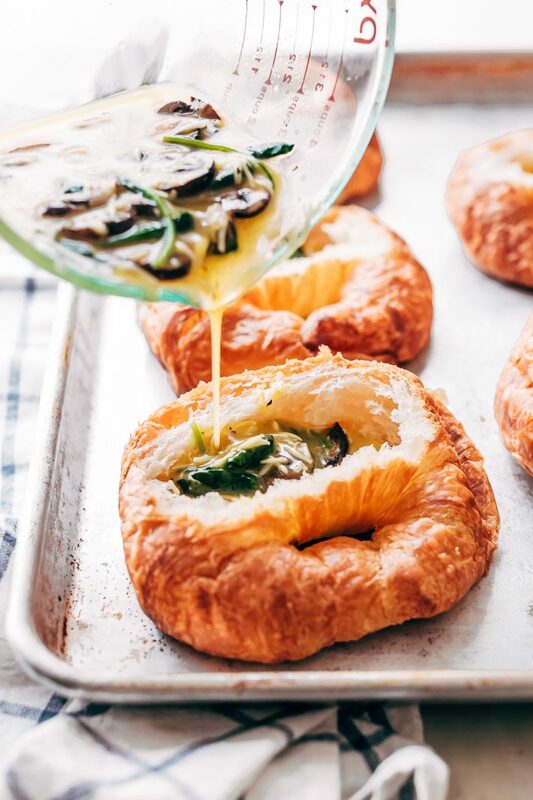 These croissant boats are the perfect grab and go option for busy mornings! You can make and freeze them, then just reheat in a toaster oven! VEGGIES: Position a rack in the center of the oven and preheat the oven to 375ºF. Grab a large baking sheet and spray it with nonstick spray or line with parchment paper; set aside. Add two teaspoons of oil to a skillet over medium-high heat. 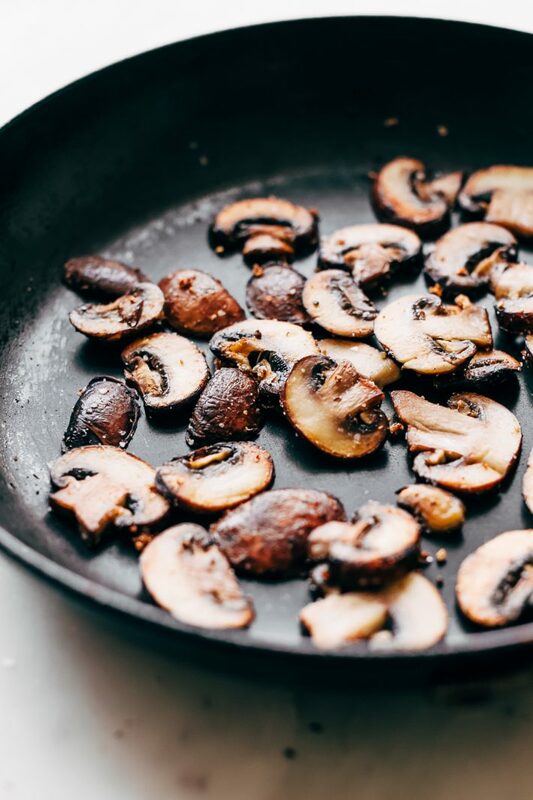 Add the sliced mushrooms and sauté the mushrooms for 4-6 minutes or until they brown on both sides. Season with ¼ teaspoon salt and garlic powder; remove to a plate and let cool. Add the remaining 2 teaspoons of oil to the same skillet along with the baby spinach allow the spinach to cook any wilt, about 30 seconds to 1 minute. Season the spinach with a small pinch of salt, make sure the spinach is mostly dried out, remove to the same plate as the mushrooms. PREP: Slice the very top of the croissant off and take out some of the soft, flaky interior carefully. Make sure the walls still stay intact. Fill it about 2/3 of the way with the egg mixture. Place the croissants on the prepared baking sheet. Add the eggs to a 4 cup mixing And beat them well with the milk. Season with ½ teaspoon of salt and ½ teaspoon of pepper. Fold in the cheese, and sautéed veggies. BAKE: Pour the mixture into the prepared croissants and bake them for 20-25 minutes or until the croissants are crispy and the egg mixture is set. Enjoy immediately or allow boats to cool to room temperature before refrigerating. See the post for other flavor combinations! For the cheese, you can use anything you like: cheddar, Swiss, provolone, gruyere or anything that melts easily! Depending on the size of your croissants, you may need to use 1-2 fewer eggs. I used the giant ones you get at Costco and those hold more of the filling. You can also wrap the boats individually with wax paper and freeze them! Just allow them to defrost in the refrigerator overnight and warm them in a preheated toaster oven for a few minutes before enjoying!